Asmara Beraki’s Anywhere Else, relates the disparate cultural experiences of a divorced Eritrean father who drives a taxi, his two U.S.-born teenagers and the newly-arrived European student who resides with the latter. Alternatively, the title invokes the multiple spaces of the filmmaker, American-Eritrean, studying and living in Prague. Asmara, I was delighted to attend the sneak preview hosted by the Washington D.C. Commission on the Arts and Humanities. In fact you were an Artist Fellowship Grant recipient for which the film was partially funded. Before talking about this latest film, let's discuss a bit of your trajectory. You have directed a few short films with very eclectic stories. Your background is similarly diverse having studied Africana Studies, Architecture and Filmmaking. Could you talk about these works and your choice of themes? Filmmaking gives one an opportunity to explore and synthesize basic human themes of existence. What tools you use to express those themes vary from filmmaker to filmmaker. In my work it's true that I use architectural symbols or sometimes elements from Africa. In The Tour Guide a Modernist building, the Muller villa, is used to express aspects of a character's personality. In Little Pickpocket the boy sorts through broken plaster figurines of giraffes and elephants. Themes are subjects like jealousy or betrayal or desire and those give life to a story, not a certain location or a prop. A person from a certain place in a certain time is reality and filmmakers work with the real. Anywhere Else, set in Washington D.C., where you grew up, is autobiographical, about your Eritrean father, who played himself in the film. You wrote and directed the film, why this theme and why did you choose to tell the story in this way? Even if the basis of a story is autobiographical the process of making a script and a film destroys, re-conceptualizes, and re-temporalizes the experiences that I only see those characters as themselves. I wanted to tell my father's story, how I saw it in a particular moment, and I wanted to explore characters who feel displaced. It is a feeling that I will probably return to in future films. I am interested in floating people, and in uprootment: a sense of feeling acutely the accident of birth and place. What was equally enjoyable was to have met your family after the screening and talk with them about their impressions! What role did they play in the film production? What were their reactions to the film? Since the screening took place in my hometown a number of family and friends were present. Both friends and family pitched in enormously with the production contributing food, cars, locations, or holding a boom if needed. I am lucky to have all of them in my life and to have such support--they were only ever positive about the final result. There was one change in the structure of the family, rather than two sisters, there was a brother and sister. Why this choice? Two sisters would have been a different story. With a male I could explore a brother/sister dynamic and also a male body in space interacts differently with his surroundings than a female would. I think the character of Emmanuel energizes the film; his frustrations are always expressed physically. The mother and her new husband appear at the very end of the film, having returned from their honeymoon. Their arrival, followed by a long abrupt cut to black, is indeed a rupture in the story as the father, brother and sister and European female student had formed a family of sorts. This absence of the mother is a metaphor for cultural estrangement as well, as the brother and sister and father appear to be struggling to find their place in U.S. mainstream culture. Some reflections? When the mother and her new husband appear they seem almost alien—awkward and disconnected--but at the same time perhaps their appearance suggests that it is in fact the characters that we have been following that are the alienated ones. In the credits you thank the filmmaking couple Shirikiana Aina and Haile Gerima, whose daughter played the sister in the film. What role did they have in your evolution as a filmmaker? Haile Gerima has shown me that to be a filmmaker you have to be tough but he has also shown me that you have to open your heart. He helped me to get the story out; we went through the situations together and he mentored the script closely. Through Sankofa [Video and Books], he and Shirikiana also contributed casting space, equipment, locations and supported Enanu acting in her first film role. On set she behaved like a pro and she's very natural in the part so I was really pleased. In what ways does the film's theme reflect Eritrean and or Ethiopian experiences in the Diaspora? In Washington D.C. the base of the city: the gas stations, the night shops, the parking lots, the taxis are largely run by people from Eritrea and Ethiopia. Not exclusively but noticeably so. That is the setting of the film. The story could be about any foreigner or divorced man; the character of the father could be from a different place and I can still imagine there would be a film. I am more able as a filmmaker to create the intimacy I desire if I use what I know best. Your essay on African cinema under the title "Azanian filmaking: Creating an African present," which you wrote in 2000, provides insightful reflections on your process early into your career. You begin by saying: "Perhaps it is because I am young. I fear my own naïveté. My eyes are too big and I talk too much. Am too open with my ideas and my stories. At this point in my life, I am a traveller. And every new person I meet and new place I visit opens up new patterns of my future. New narratives I must act out. New selves I must create." You invoke Frantz Fanon, you talk about your positionality as an African, you talk about class and South Africa. Where are you now in relation to these thoughts? At that time I was working on a documentary about wine and fruit farm workers in the Stellenbosch region. I did not really consider myself a filmmaker; I was playing with the idea but thought I would eventually take the path of an academic. I had just completed a whole course on Fanon at Brown [University] where anyone who's anyone flirts with being revolutionary. I still like to believe that to make a film you need an idea or a story and you need people and then money comes later. That sounds idealistic, but a meeting between people who want the same things can be powerful. I haven't read the article I wrote in years, but I think I was trying to express this: if you want to--do it, try. You are doing your film studies in Prague (The Film and TV School of the Academy of Performing Arts, Czech Republic) and currently live there with your family. What are some of the differences and similarities to your experiences in the United States? In terms of film, Prague has given me a lot. At FAMU I've met great people that I can communicate and cooperate with and I've been able to concentrate on developing craft. I haven't been burdened there by U.S. identity politics. The younger generation is very cosmopolitan and open; the older generation is more noticeably marked by the communist past. It's a different society than the U.S., different traditions, different ways of interacting. I used to have culture shock there, and now when I step into JFK airport I look around and feel surprised. 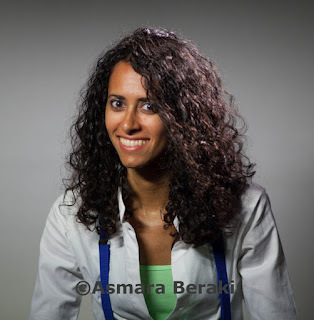 Interview with Asmara Beraki by Beti Ellerson, September 2012.